I’m writing some Hallowe’en stories this week which have been inspired by some images I have found in my local area. Maybe I live in a spookier neighbourhood than I thought…..
Rudy hated roses because of her mother. Her mother had been the greatest rose grower the town had ever seen, growing everything from floribundas to old garden roses and everything in-between. Everyone in town always went on and on about how busy Judith – Rudy’s mother – was with all the attention she gave to her roses. How beautiful the roses were, how healthy, the colours were glorious and oh, the scent on a summer’s day was enough to make you believe in a better world. Rudy got sick of all the fuss people made over her mother’s roses. She wished that her mother had as much time to spend with her as she did with her roses. She tried over and over to get her mother’s attention – baking her cakes and brewing her favourite Turkish coffee. Asking her if she’d like to go to the zoo or the beach or for a walk in the park. Leaving her funny notes and drawings that she probably didn’t even read because the next day Rudy would find them crumpled on the road. When Rudy moved into her new house there was a rose bush by the front door. Red and ricketty. Ablaze with thorns. Virulent with sweet-smelling petals. At night Rudy had to keep her windows jammed shut with rolled up towels just to keep the scent out and even then it managed to slide under the sills like some kind of heat-seeking missile. One morning when Rudy was making the bed she noticed that the pillowcases smelled like rose petals even though she had washed them in unscented soap powder. She got an axe from the garden shed and swinging the blade like a crazed lumberjack cut the rose bush down. That night, for the first time since she had moved in, Rudy slept with the windows open. The air was fresh, clean as rain on grass. There wasn’t even a hint of rose scent in the air. It was invigorating. The next evening as Rudy returned from work she noticed a shadow on the front wall, unmistakeable in form, as distinct as if it had been painted there. It chilled her as it irked her. 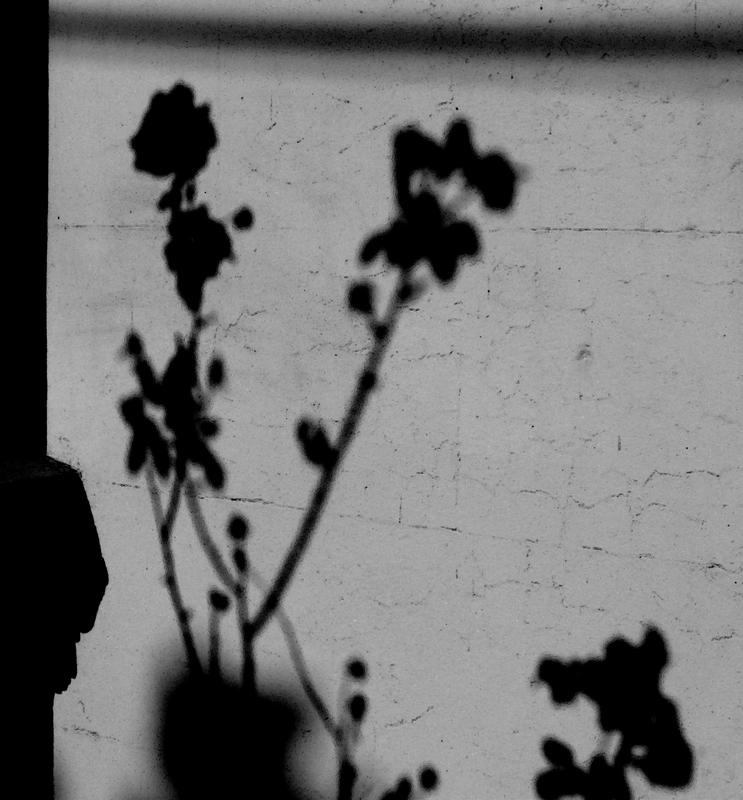 The shadow of a rose. Every evening it was there. Stems, petals, thorns. In umbra. Rudy checked the garden, the road, her neighbour’s garden across the street for any vagabond rose bushes that might be casting a vexatious light on her front wall, but there was nothing. She got a scrubbing brush and a bucket of hot water full of disinfectant and rubbed the wall clean but within seconds the inky contours of the shadowed rose broke through. In the middle of the night Rudy woke to shadowy movements on the ceiling. She thought it was the blind come loose, catching the glare of the street light, but it was firmly fastened to the window. The scent of rose petals, sweet, cloying was in her nose, her eyes, her mouth. Rudy ran to the front door, throwing it open, gasping. The shadow of the rose clutched at the wall; imperious, obstinate. By the end of the week the shadow of the rose had stretched the full length of the hallway, turning the rug dark red. Rudy could smell the rose petals all the way back in the kitchen. She burned incense and sage but the smell wouldn’t retreat. Nor would the shadows, colossal as trees. In bed, her earphones jammed into her ears, a blindfold tied to her face, Rudy struggled with sleep. She taped the windows and doors shut, hung blankets and quilts around the walls to block out the light, but the shadows, elegant and sinister, manifested. Roses, roses, hundreds of roses. Rudy couldn’t escape the sight of them. Rudy couldn’t escape the scent of them. She was in a shadowy, perfumed hell. Tormented, tortured, cursed. Roses, roses everywhere. Not one of them real. A forest of them, making the floorboards warp with their weight and their might. How could she evade them? How could she avoid them? There was no hope for a neutral bouquet in this rose-heavy world. Rudy was blighted, scourged, begging for mercy; she was haunted. I was waiting for the story to go sci-fi and attack thorns first, but I remember that you are a classy and talented writer–as opposed to myself where tales tend to resemble a very low budget movie. It’s a bit of a crazy story, truth be told, Slamdunk. Didn’t quite pan out the way it did in my head. Sometimes that happens. It was just a bit of fun, really. Thanks so much for reading! Wow, easy to fight something concrete, but a phantom shadow growing larger and more powerful… well done, Selma, that was scary! You do write well! Thanks, Mags. It certainly is different. Don’t know why my mind thinks the way it does sometimes. The thing is – I actually LIKE roses. Hahaha. Well, who isn’t suspicious of indoor plants, Bluebee? I’ve heard they come alive at night. LOL. To even be mentioned in the same breath as Roald Dahl – such an honour. WOW. Thank you! Hahaha. Being stalked by a rose bush would be no fun, Karen. I did have fun writing this! That is a really good point, Tipota. It didn’t occur to me at the time but maybe I was moved to make the rose ghostly because Rudy chopped it up because I have a lot of affection for roses and find them to be quite beautiful. That is the great thing about writing – so many people have different interpretations. I love that. I’ll take all the roses too. Fill the gardens up!!! Good one Selma! Suitably spooky and I got quite the laugh thinking about your comment of how horrible it would be to be stalked by a cactus! Can you imagine being stalked by a cactus, Cathy? Especially those big hairy ones. It would be terrifying. Yikes! This was wonderfully creepy. I am still haunted by the smoky spirit every now and then and I know EXACTLY how she feels! Yes. Your smoky spirit. That is spooky. I wonder who it is. It must be more than a little creepy at times…..
“Virulent with sweet-smelling petals…” and the ax scene. Amazing that you can make roses as creepy as zombies. I love your creepy tales but I can’t imagine writing one. I think I just grew up with too many real-life creepy tales. Still, it would feel devilishly fun and extremely naughty. Hmmm. It is fun, Squirrel. I’m telling you. It is therapeutic in a strange way. You can use really over the top imagery in horror fiction and there is a lot of melodrama. It makes me less of a drama queen in real life. Truly. Hahaha.